Online travel portal Yatra.com has reported revenues of INR 685 crore in the FY 16-17. The company offers travel booking services including hotels, flights, holidays, trains and buses. Yatra recently released its financial statement for the FY 16-17, which has revealed that the company revenues have gone up by 11% over the previous year’s revenues of INR 616 crore. 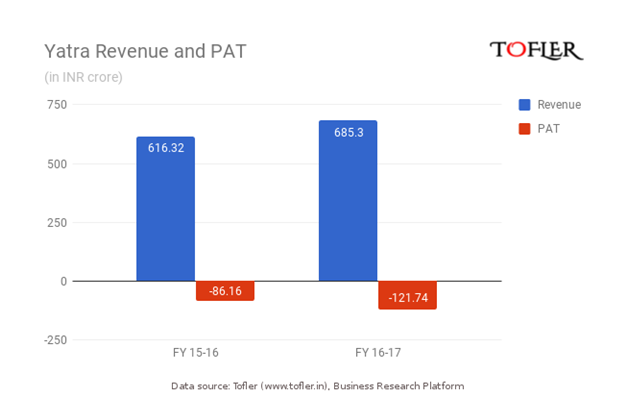 On the other hand, the company’s profit and loss statement reveals it has sustained losses of INR 122 crore in FY 16-17, which is up by 40% over the previous fiscal year. Yatra earns its revenues almost entirely from the sale of its services, the bulk of which comes from the holiday packages it offers. The company is known for hassle-free ticketing and hotel booking, on which it earns revenues in the form of the convenience fees, commissions, and cancellations. In FY 16-17, the company made INR 670 crore from its services alone. The online travel agency’s expenses for FY 16-17 stood at INR 807 crore, which is a rise of 15% over the previous year’s expenses of INR 700 crore. 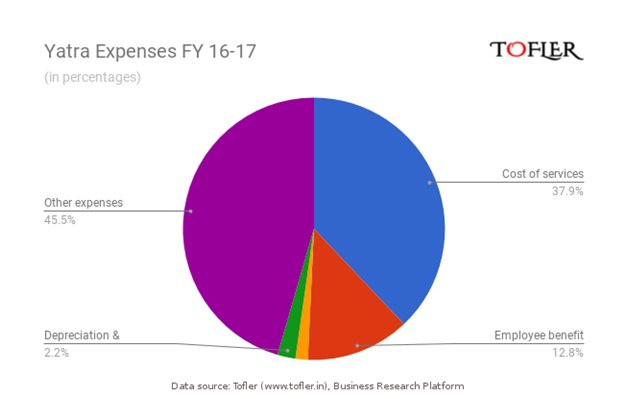 A look at the expenses breakup year over year reveals that while employee benefit expenses have remained largely unchanged between FY 15-16 and FY 16-17, advertising promotional expenses have gone up by 60% to INR 235 crore from INR 148 crore. These expenses may be attributed to Yatra having launched a series of television commercials featuring Bollywood celebrities as part of its brand revamp. Yatra was one of the earliest online travel portals launched in India in 2005 with its headquarters in Mumbai. In 2012, the company was the second largest travel platform in India. In 2016, it got listed in NASDAQ. The company currently has a market share of 19% to 20% in terms of overall gross bookings, while Makemytrip and Cleartrip lead in that order. With more than 400 million mobile internet users in India, there is plenty of potential for online travel agencies and travel apps to find success in the market. However, competition is tough. Yatra currently has more than 2300 employees and offers unique features like its eCash loyalty program and a protection against flight price drops. With Yatra working on innovations and efforts to woo customer loyalty and not merely offer discounted fares, it will be interesting to see where Yatra takes its online travel portal.